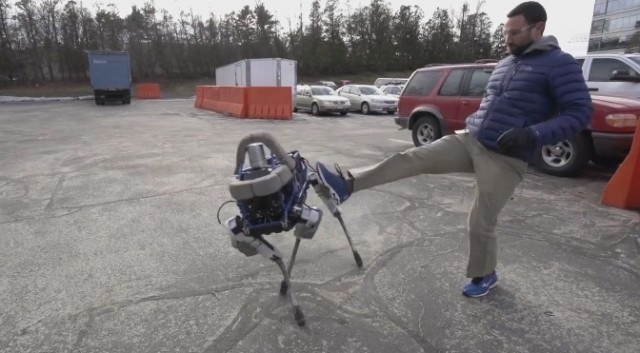 Google has revealed the latest automaton to come out of its Boston Dynamics lab, a robotic dog which can withstand a hefty kick from a human. The device known as Spot was created by Boston Dynamics and has four hydraulic legs, a sensor head and the ability to navigate challenging terrain. It can keep up with running humans with an equine-like canter, and video shows it managing to stay upright even after someone kicks it from the side. It is lighter than most of the firm’s other robots and can be used both indoors and outdoors. Spot could one day be used to help with search and rescue missions, mapping out areas, and accessing disaster zones. Boston Dynamics has previously created a much larger dog-like robot called BigDog, but the latest development appears to be faster and more agile. The company has also created RiSE, a robot which can climb vertical surfaces like walls and trees, as well as human-like robots called Atlas and Petman. Google acquired Boston Dynamics in 2013 but the price was kept secret. The company immediately stated one clear principle – its robots would not be used for military ends. With fears mounting about Google’s wealth, power and knowledge of every aspect of our lives, it’s easy to understand why it wanted to give that assurance.